Bank robbery pulled off by the bank officials, not the usual James gang. Mary Whittaker: What would you do, Captain, if you saw Jesse James? Captain Worthington: There's only one thing to do... shoot first and ask questions afterwards. Not much fun...and a historical nightmare. Let's set the record straight. Jesse James was a slime-ball. He, his brother and their gang were thieves and murderers--there's simply no doubt about it. However, inexplicably, these folks (particularly Jesse) have been portrayed a bazillion times in movies as nice guys. Well, I have news for the filmmakers--nice folks don't murder people and steal! So, when I see films like "Days of Jesse James", the history teacher in me (yes, I taught US History) cringes. That reason alone is why I wouldn't recommend the film. However, there is one other reason--it's a pretty dull movie as well. 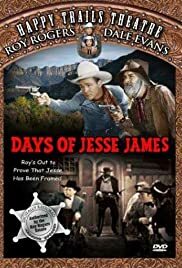 Jesse James is played by Red Barry of the Red Ryder series fame and while he's not as important a character in the story, Cole Youngeris played by Glenn Strange who later played Frankenstein in several Universal films (such as "Abbott & Costello Meet Frankenstein"). This is pretty interesting, though Strange did appear in lots of westerns. The film begins with Gabby and his daughter heading to the city to put his fortune in the bank and settle down to a life of retirement. However, soon after, the bank is robbed and his money is stolen. At the same time, Roy Rogers (once again playing himself, of sorts) arrives in town to investigate some robberies attributed to James. Rogers thinks James isn't that bad a guy and isn't sure whether many of the crimes were really perpetrated by James or his friends. And, to find this out, he and Gabby infiltrate the gang. The plot is pretty predictable--even for a Roy Rogers film. It lacks any sort of twist and the film is certainly not among his best. Oddly, Rogers also made a film that involved Billy the Kid--and it wasn't so inaccurate and was quite entertaining. This one, however, just seems pretty ordinary--at best. Even the songs are pretty flat.